"The Mexican" A most unusual Cherryburst stop tail-the first I've ever seen. Probably a very early 65. Teachable Moment or Original Finish? Wow, is this guitar shiny or what. But is the finish original and buffed out or a refinish or respray? I just bought a 66 ES 345 that was advertised as mint. Those of you who read me all the time know how I feel about the term “mint”. I could tell from the photos that it wasn’t mint but it sure looked pretty good to me and the price was right. When I got the guitar I was astonished at how clean the finish was. There were no pick marks on the lacquer. There were a couple of chips here and there but was it ever shiny. The back of the neck had virtually no wear at all-just one chip. The fingerboard, however, seemed like the guitar had been rode hard and put away wet. The guitar appears to have been refretted. That would mean that the original owner, who owned it from 1966 until 2010 had played it through at least a full set of frets and maybe half of the set on the guitar now. The guitar had rubbing compound and polish everywhere. The gentleman I bought it from-not the owner-told me a story about the guy he bought it from. he said the guy picked the guitar up with a polishing cloth and a towel. He was apparently constantly polishing and cleaning the guitar. That would explain the lack of pick marks. It would perhaps explain the condition of the body but bear with me here. Wouldn’t this same owner keep the fretboard clean? It looked like the guitar was played by Pigpen (from the comic not the Dead). It had dirt piled up on every fret and polish in all the cracks and crevices. There was a ton of dried polish under the pickguard and under the truss rod cover. On the “it’s an original finish” side of the coin-the electronics were completely untouched-no broken solder. 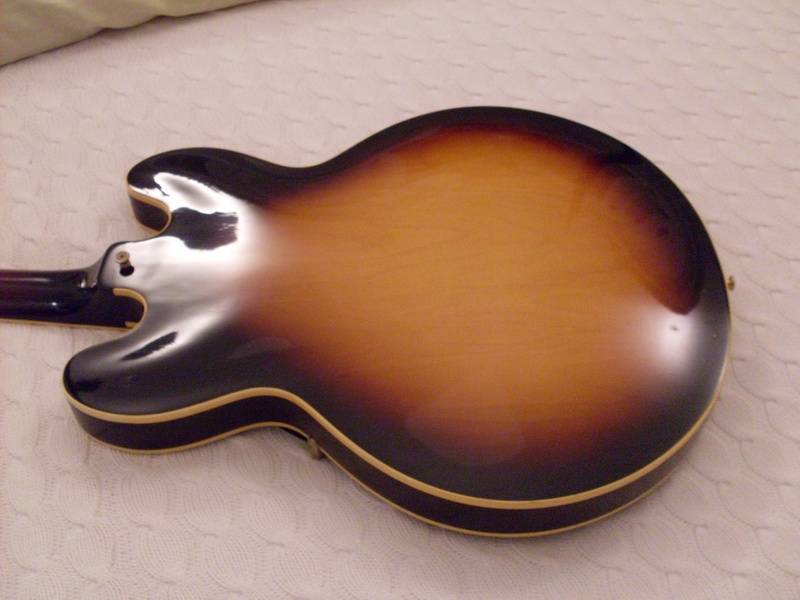 I don’t think you could do a refinish without removing at least the pickups from the harness. But you could probably do an overspray which I think is possible. If it was oversprayed, it was done brilliantly. There’s a small flaw on the back but that’s quite possibly factory since the guitar is marked “2” for second which usually denotes a small finish flaw and not a problem with the functionality. So, I’m concerned since finishes are a bit outside my level of expertise. It sure looks original but it looks too good for the amount of wear on the gold and on the fingerboard. On the other hand, if the guy was nutty about polishing his prized possession, then it may make some sense. The teachable moment part is don’t just look at the finish, look at the rest of the guitar. Does it make sense that the finish is in such great shape and the hardware and fingerboard are showing a great deal of wear? That’s one of the first things I learned about how to tell a guitar has been professionally refinished. The fact that there was polish under everything says that the guy certainly liked to polish his guitar. It also means that he NEVER took these parts off after it was presumably refinished. That makes no sense. If someone is trying to pass off a refin as original, you can bet he’s going to go over the thing and make sure there are no signs of polish or rubbing compound. So, I lean toward the guitar being original. I need to decide whether to return it in a few days. The seller has agreed to take it back and he has agreed to give me the phone number of the original owner so I can discuss it with him. The fact that the refret wasn’t disclosed by either of them gives me pause however. This is hard. Judge for yourself. Refret? I think so. Look at that crud on the 'board. Look at the crap that was left under the pickguard. It appeared to have been there for very long time. Also note the amount of wear on the gold pickup covers. You thought the front was shiny? Yikes. I had to put on sunglasses. This what the 58 label looked like. Note that it doesn't say "Union Made" anywhere. It's hard to photograph the whole thing on a 335, so this is from an acoustic. .It also stated that it was made by Gibson and that Gibson was in kalamazoo, Michigan and that it was guaranteed against faulty workmanship whatever that means. As an aside, there was no serial number anywhere else on the guitar and if the sticker came unglued from the inside of the guitar, you were out of luck if you wanted to know its serial number. This made it pretty easy for thieves to disguise their stuff when it came time to visit the local fence. There is something called a FON (factory order number) which was stamped into the guitars but that’s a separate post which I’ll get to eventually. The orange oval stayed the same until some time in 1964. The serial number began to appear on the back of the headstock in 1961 and the letter A was dropped from it. In 64 (late 64, I think), Gibson added the words “Union Made” to the label. I don’t think they unionized in 64-I think that occurred earlier-they just put it on the label during that year. It’s a helpful tool in the difficult task of dating these guitars. 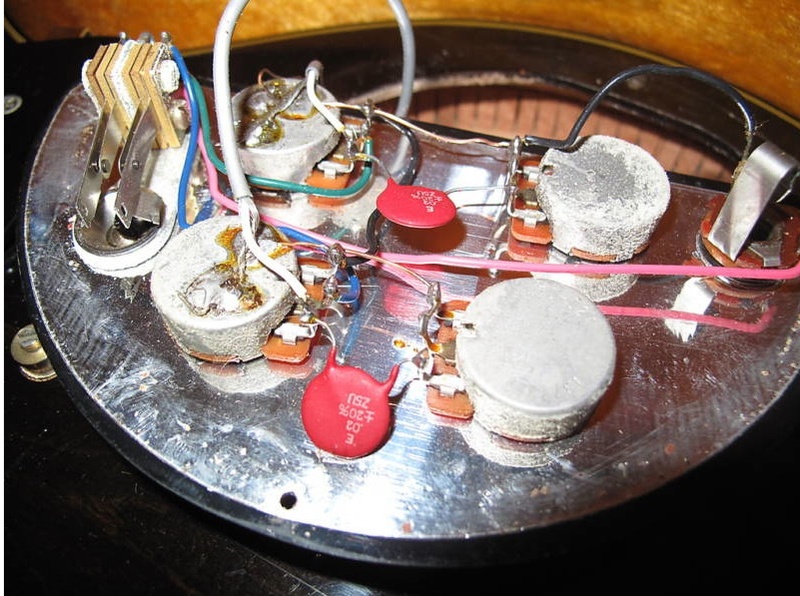 If the guitar has a stop tail and a Union Made label, it’s either a late 64 or very early 65. The “Union Made” designation began to disappear (again, Gibson didn’t waste anything, so they continued to use that label until they were gone) in 1968. By 1969, the label looked pretty much like it did in 58. That also didn’t last long because Gibson was sold in 69 to Norlin (Beer, Concrete) and the label would change again to a white one with purple and black triangles. 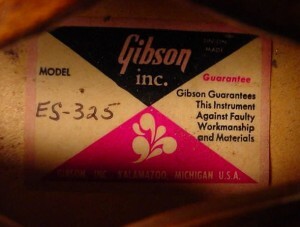 That label stayed with Gibson until the early 80’s when Norlin made its last ditch attempt to make a quality guitar and the White label appeared. It noted that Gibson now had a plant in Kalamazoo and another in Nashville. When the Kalamazoo plant closed in 1984, the city disappeared from the label. 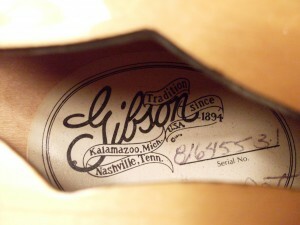 Then, in 86, Gibson was sold again to its current owners and a different white label appeared. 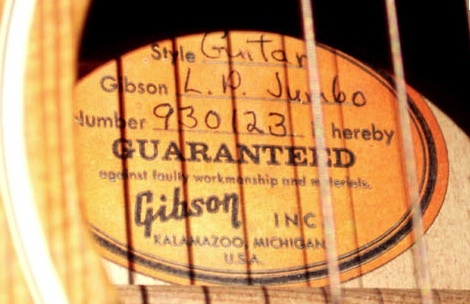 I’ll do a separate post about the modern Gibson labels which are kind of all over the place. One-Off Gibsons. Ya Gotta Love this Stuff. 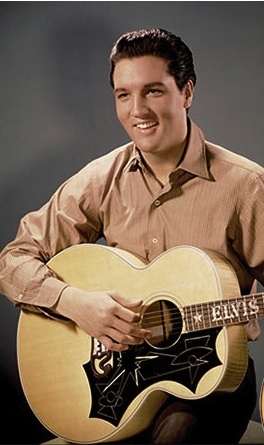 Elvis with his J-200 with custom inlays and custom pickguard. One of the things I love about Gibsons is that they made so many one offs and oddball versions of the same guitar. I suppose it’s because they considered themselves kind of a “Guitar Maker to the Stars” . They pretty much invented the “artist signature model”. Who else made something like that in the 50s? The Les Paul, The Barney Kessel, The Trini Lopez, The Tal Farlow, The Johnny Smith and probably one or 2 I’m forgetting about. Gretsch did it early on with the Chet Atkins models but Fender didn’t really get around to it until much later. Now there are literally dozens: Clapton, Alvin Lee, Elliot Easton, Jimi Hendrix…even Kiefer Sutherland has his name on a Gibson. Even more bizarre is that they have artists models that are named after other artists. The Les Paul Billy Gibbons? The Les Paul Mike Bloomfield? Eventually there will be a Gibson Les Paul Jimmy Page Joe Blow model once Joe Blow starts playing a LPJP and gets famous. 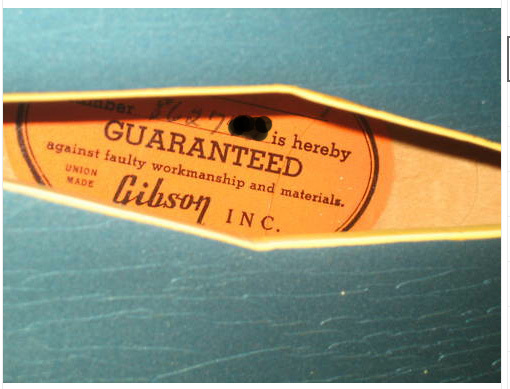 Gibson would make one offs long before the concept of the Custom Shop existed. Gibson made quite a few artists custom guitars to a particular artists specifications. Elvis’ J-200 is perhaps one of the best known, of course his had custom inlays. 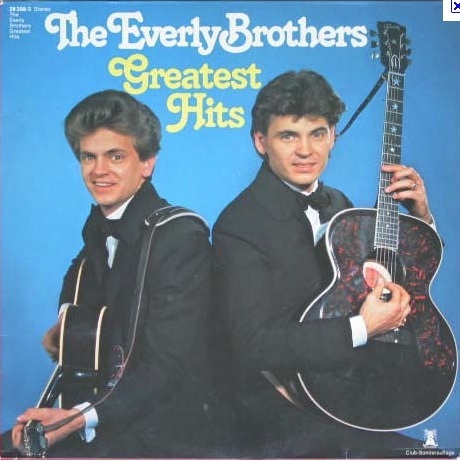 The Everly Brothers had custom black J-185s with double pickguards and star inlays. Some one offs aren’t built for the stars and are sometimes labeled “prototype” or no serial number at all. Here’s one I’ve never seen until now. I was doing my daily 335 search on Ebay and came across this. 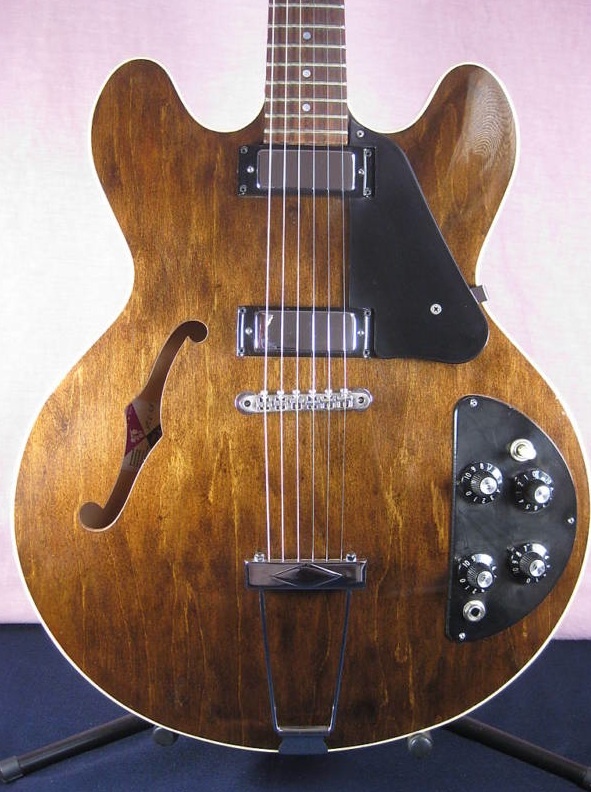 A mahogany ES-355. It appears to be and is listed as a 67. The construction appears to be stock-it isn’t made from solid mahogany, it is, like all 335s/345s and 355s, made of plywood. The top layer is maple on production guitars but not this one. The red stained mahogany looks very cool and it gives the guitar an even more “formal” look-kind of a guitar in a deep red tuxedo. It probably wouldn’t look good on you (or me for that matter) but it looks great on a 355. The listing says it may have been an experiment by Gibson to see if it was a viable alternative to maple plywood. I think that’s a pretty likely scenario. I don’t know what the price of mahogany plywood was like in 1967 but today, it’s quite a bit cheaper than maple. Cheap mahogany plywood shows up everywhere it seems in building materials but not so frequently on guitars. I would be very interested to see if it sounds any different and will probably email the seller to get an opinion. As far as the price goes, it’s really hard to assess a one off guitar’s value. It’s rarity doesn’t really count for much, unfortunately. The seller has a buy it now of just under $8000. 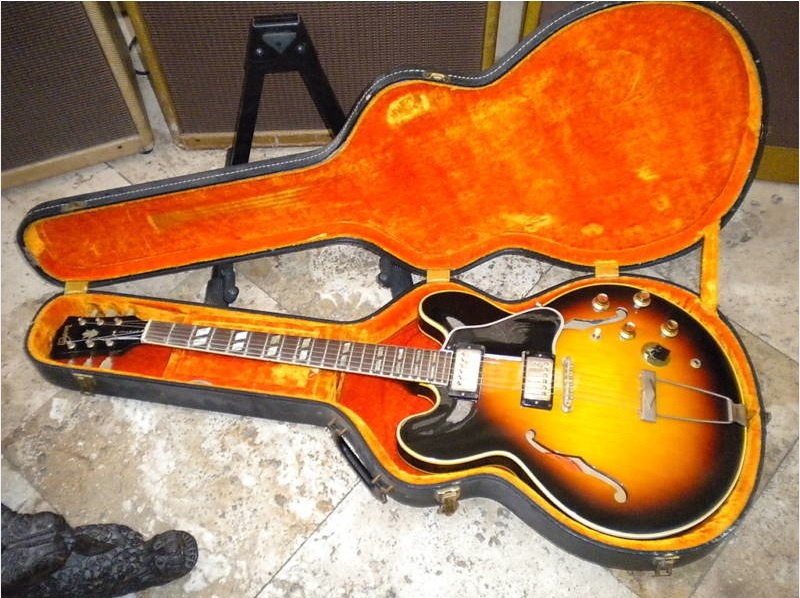 That’s around double what a 67 ES-355 SV is worth. I would price a normal stereo 67 in similar condition at $4000-4500 give or take. I just think having the only one would be sort of cool. Unfortunately, the necks on these are really narrow-this one looks like it could be 1.5″. I think if it was 1 5/8″ or larger, I wouldn’t hesitate to make an offer. I’ve actually never owned a 355 and I have no excuse for that since I really like ebony fingerboards. I have owned at least 3 SG Customs which have the same fingerboard and inlays and liked all of them. When the Norlin Corporation (Beer, Concrete) got into the guitar business by buying Gibson from CMI (Chicago Musical Instruments) in 1969, they didn’t waste a lot of time before slashing costs and quality. In 3 short years, they took the venerable ES-335 and turned it into a substandard, inconsistent shadow of its former self. As if that wasn’t bad enough, they took a page from the CBS/Fender school of Waste Not Want Not business practices. When they had too many of a certain part, they would make these Frankenstein guitars that were intended to use up extra inventory from the parts bin. Got too many mini humbuckers and no guitar to put them on? No problemo, let’s stick ’em on a 335-it worked on the old Epiphones so what the hell. These guys were so cheap, they actually cut costs by cutting only one f-hole. and speaking of f-holes, the Norlin Corporation also figured they could save some time by cutting another hole to make it easier to put the harness in and just cover it with a plastic control panel that looks a lot like the one they used briefly on the SG. 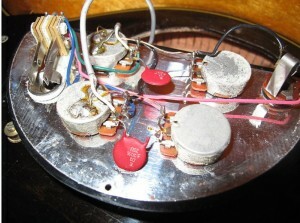 Then, in another Fender-like time saving trick, they pre-wired the controls to the cover and just dropped it in. Everything-even the jack is on the plate. No fuss, no muss, no regard for ergonomics. I’m surprised they didn’t figure out a way to pre-wire the pickups onto the guard. Fender figured out how to do it, I’m surprised Gibson took the extra step of routing the body to accommodate the pickups. Everything is right here-wired up in advance and just dropped in to a big ol' hole in the body. Nice. They must have had a surplus of black Les Paul pickguards because with a little cut here and a rounded edge there, they had the guard for their new ES-325. I’ve seen them in walnut and red but I’ve never seen a sunburst. 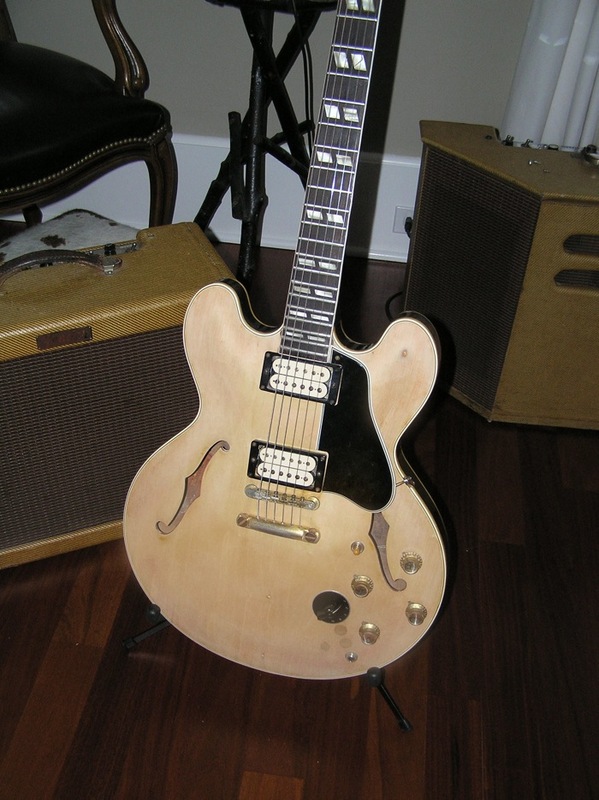 I’ve also seen one in natural but it could have been a refin but it could have been original The wiring is standard ES-335. The early ones had ABR-1 bridges and later, they showed up with the “harmonica” bridge. I haven’t had the honor of playing one but given that they were produced during an era when even Gibson’s best guitars were transformed into crap, this low end “parts bin special” was probably not such a great instrument. I’ve played decent 70’s Gibsons. They are out there but I wouldn’t buy one without playing it first. These, when they actually sell, appear to be in the $2000 – $2500 range. I think you can find a better instrument in that price range from the early 80’s. Personally, I would take a 90’s or a recent 335 over one of these. They are just too ugly for words and you know the build quality is going to be marginal at best. “Mint” means, uh, MINT and “One Owner” means…. Check out those ears! on a 66! Look at those tweeds. Too bad they aren't mine. I love Fender tweeds-my Deluxe is my favorite amp and my 59 Bandmaster was the best I've ever owned. How many times have you seen an Ebay or Gear Page listing that says “guitar is in mint condition”? Or even better guitar is “mint for its age” or “mint for a 50 year old guitar?” I’m sure you’ve seen it a hundred times if you’ve seen it once. 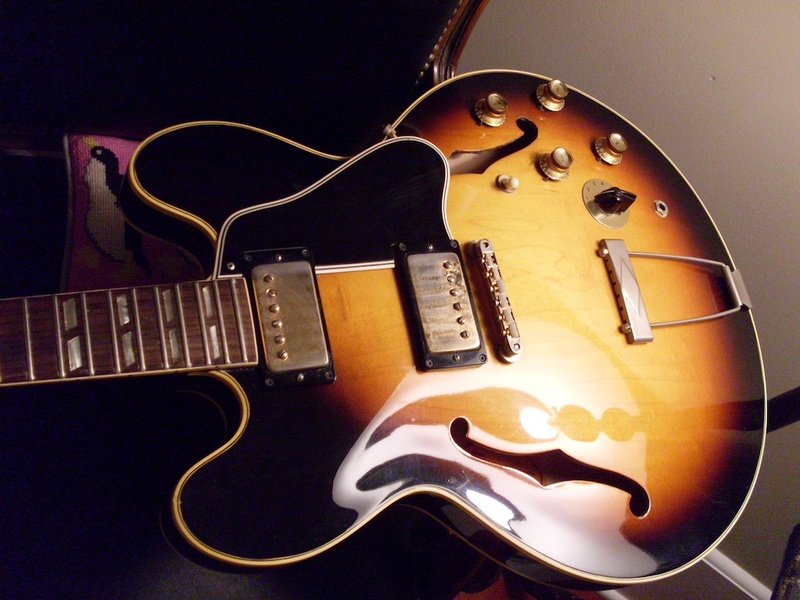 I bring this up because I bought an unusual ’66 ES-345 from an Ebay seller that was described as “mint”. I was going to wait until I received the guitar and use it as an example but I don’t like to call too much attention to my guitars in the interest of keeping this site from becoming too commercial. Here’s the peeve: The idea of anything being mint “for its age” is preposterous (and ridiculous). Mint means it is in the same condition it was in when it left the factory. No more, no less. It can be excellent for its age or very good for its age but it can’t be mint for its age unless its mint. There’s a perfectly good term for a guitar that’s in exceptional condition for its age but isn’t in factory condition. It’s very useful and I use it, albeit sparingly. It’s “near mint”-not “near mint for its age” but near mint. To me, that means it is very close to mint condition but shows perhaps a ding or minor scratch or 2 but no play wear or fret wear. A bop on the headstock will take a guitar from mint to something less and near mint (with the explanation that it would be mint but for the ding on the headstock) does the job. I don’t care if the guitar was put under the bed a week after it was bought, if there is damage of any kind, then the guitar is not mint. Period. Actually, I have to mention one other peeve and it’s also in reference to this particular ES-345. This is just dumb. In the heading, he calls the guitar a one owner guitar. To me that means he’s the original owner-that’s why they call it one owner. Here’s the quote from the listing: “I purchased this guitar from the original owner 5 years ago and it has been in my collection since.” So, he calls the guitar a one owner and it isn’t. he calls it mint and then states: “There is slight discoloration on the original Humbucker pickup covers.” OK, so not quite mint. I can overlook discolored brightwork. So, why did I buy it? Check out the ears. If those aren’t almost Mickey Mouse ears on a ’66, then I’m blind. I’ve seen this twice before. I had a red ’66 with the same body shape. Most 66’s have very pointy horns. Check the photos of the 345 and the 335 that I’ve also put up. To the sellers credit, he guarantees the guitar to be as described. It already isn’t since he called it a one owner guitar but I’ll reserve judgment until it shows up. You’ll see it in the “For Sale” section very soon. You can be pretty certain I won’t describe it as “one owner” and “mint”. Here's another shot. If it wasn't for the trapeze, I would guess this was a 62 or 63. These are the pointiest 66 I've ever seen. Very narrow, too. Compare them to the 345 above. This week my real life job as a TV director, editor and sometime cameraman took me to Martha’s Vineyard to tape a musical called “The Runaway Beauty Queen”. The writer/director/co-producer of the show is a friend of a friend and I agreed to shoot it and edit it on a shoestring. As part of the project, I had to stay overnight and was put up at the home of the other co-producer. Her name is Judy Belushi Pisano. 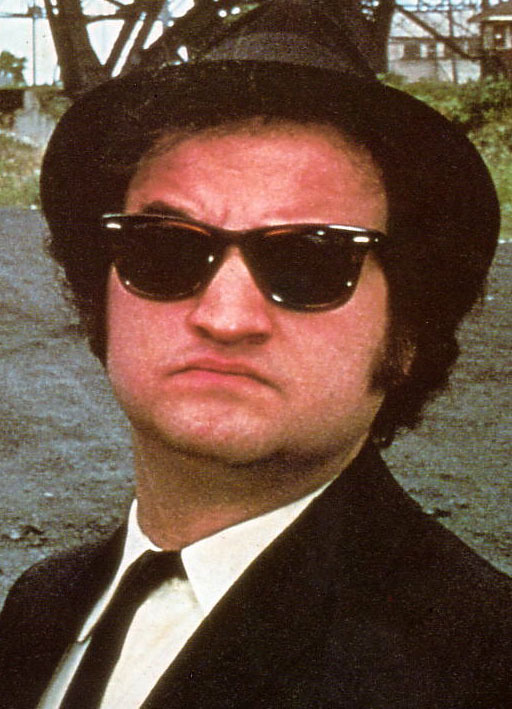 Yep, that Belushi. Her lovely home on the island was filled with wonderful memorabilia of her husband and she clearly enjoyed having his things displayed prominently. As a collector, I never had much use for provenance-or, put simply, who owned the guitar before I got my mitts on it. I never felt that who owned it was of much consequence and certainly wasn’t worth paying a big premium for. After all, I collect guitars, not famous people’s stuff. 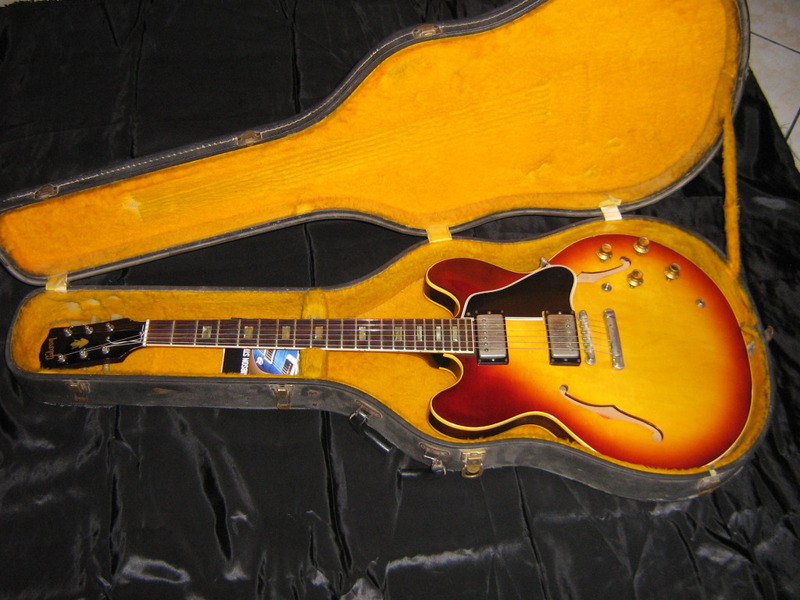 Clapton’s ’64 ES-335 was worth around $15,000 to me because that’s about what a well played stop tail 64 is worth. Of course, not everyone agrees with my disdain for provenance; the Clapton 335 sold for nearly $900,000. You get the point. So, while lunching at the famous Black Dog Tavern in Vineyard Haven along with the show’s musical director ,the conversation turned to music. And guitars. I’ll digress here a bit. The musical director is a gentleman named Paul Jacobs who is a scarily talented working professional musician who toured with Meatloaf, Roy Buchanan and Edgar Winter. Anyway we were talking about vintage guitars and Judy said “I have John’s old electric guitar but I think it’s in kind of bad shape-it hasn’t been played in a very long time.” When we went back to her house, I asked if I could see the guitar and she obliged. When I opened the case I was looking at an early 70’s Fender Telecaster Custom-you know, the one with binding and a sunburst finish. It had been borrowed in the years following John Belushi’s tragic death by a blues player who put 13’s on it and used it for slide. Then it was put away for many years just like that. When I picked it up to play it, I could see the neck had been pulled into a very concave state by the heavy strings. It barely played. The strings at the 5th fret must have been a full quarter inch off the board. Yikes. I asked if she wanted to have it put back into playing condition and she said yes. So, after the shoot, I left with a 73 Telecaster that had been John Belushi’s main guitar. It had certainly been played by John and probably by the likes of Matt “Guitar” Murphy and Steve Cropper. 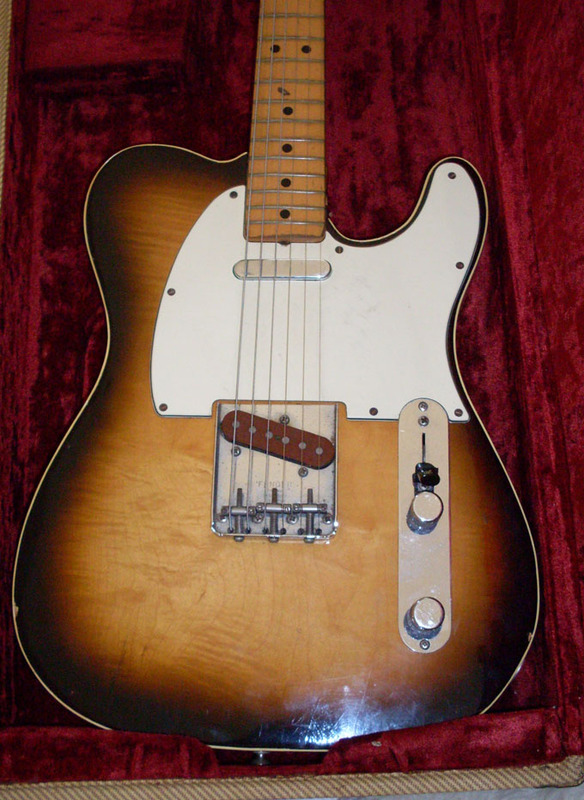 It felt different than just another Telecaster. It had history. Suddenly, provenance took on meaning… I mean, I got it. Would I pay an extra $850,000 for a guitar played by Eric Clapton? I think not. There are probably hundreds of guitars played by him, if not thousands. And, he’s still alive and will likely play a lot more of them. But this was John Belushi’s main guitar for around 10 years and I’m lucky enough to be its caretaker for a short time. I’ve already restrung it and adjusted the truss and it has responded nicely. Now, I’m going to go upstairs and play it. I think I’ll start with “Soul Man”. Joliet Jake Blues didn't play guitar on stage when the Blues Brothers performed. After all he had 2 guitar giants with him-Steve Cropper and Matt Murphy. This was John's 73 Telecaster that is currently owned by his widow, Judy Belushi Pisano, who is one of the nicest, kindest, most generous people on Earth. 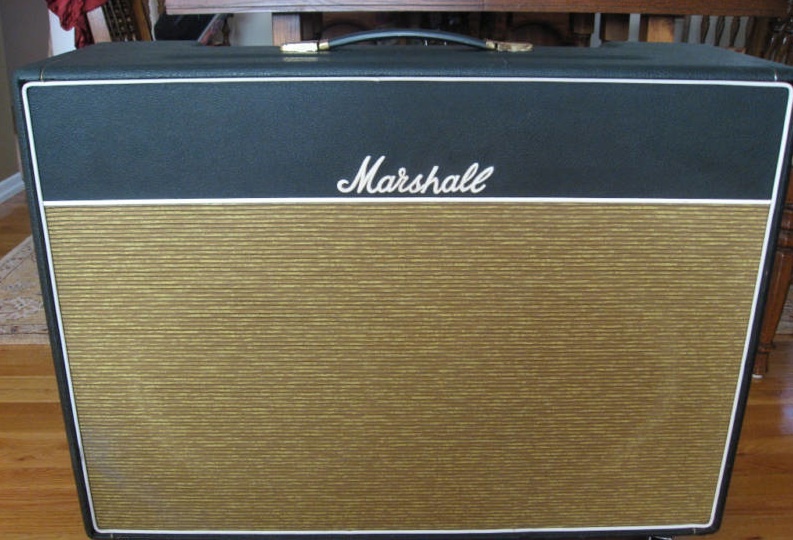 This isn't my '68 Marshall but I have mine set up in a repro Bluesbreaker cabinet and I would say it is close to being the perfect amp for a 335 playing blues and rock player. The one is the photo is NOT a Repro. I did a post on the best amps for stereo guitars and have had requests to give my views of great amps for a 335. This is a lot harder to do since, first of all, there are so many amps that sound great with a humbucker equipped guitar. In fact, in general, any amp that sounds excellent with a Les Paul is going to sound as good with a 335. Beyond that, there has been an evolution in Gibson’s pickups that affects how these guitars sound with a given amp. So, I’m going to have to generalize and speak from personal experience. Speaking from experience, I don’t play through new amps so I can’t really comment on all the great boutique amps that currently populate the backline of so many players. So, if you’re going to play your ES-335 (or mono ES-355 or de-Varitoned ES-345) through a “Divided by 13” or a “Bad Cat” or a “Fargen” or a “Komet”, Cupid, Donner or Blitzen. 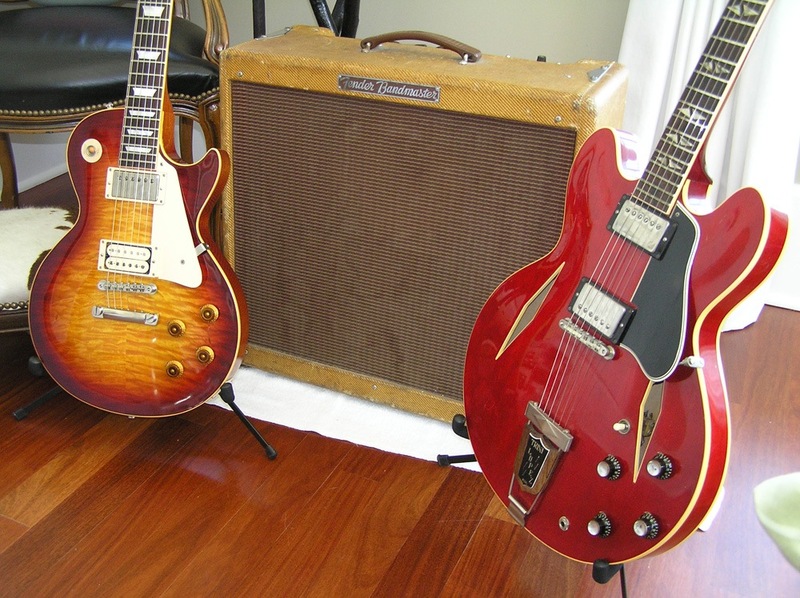 So, what about great vintage amps for a 335? Fender tweeds-especially those with ten inch speakers: Harvard, Vibrolux, Super, Bandmaster, Bassman. Maybe it’s because there is so much big fat wide frequency response that the ten inch speaker handles it best. Not sure why. 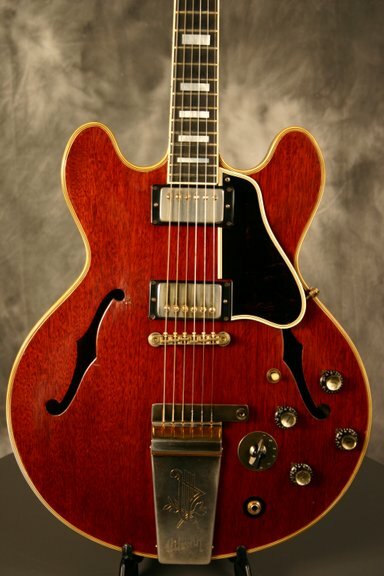 I like a 335 through a Deluxe almost as much. No pedals required-just a reverb unit. I was never a Marshall guy until recently and now I get it. I have a 50 watt ’68 plexi panel Super Tremolo that I’m bonding with in a big way. It is so full and musical that it makes me a better player whether clean or gritty, it is so articulate and defined-much like a Tweed Bassman-that you better play carefully because every sound you make comes through. Black face Fenders match up very well. A BF Deluxe Reverb is a great match. I had a Vibrolux Reverb that I loaded a pair of 50’s P10Qs into that sounded like God. Any BF with a JBL will just sing for the jazz player or any player who craves clean. I had a JBL loaded BF Vibroverb that was great clean but I could crank it up and rattle the neighbors windows and it wouldn’t slip into that sweet tube saturated distortion we all love so much. Can’t afford a Marshall or a tweed Bassman? 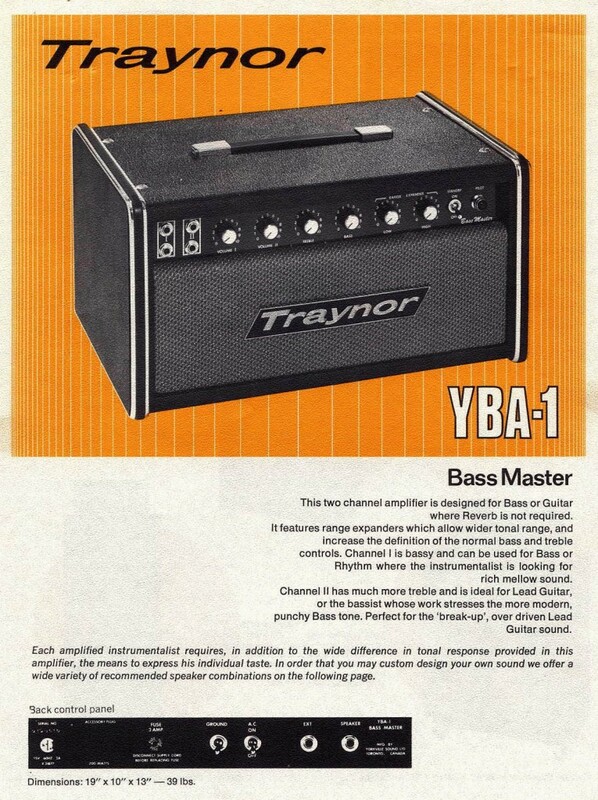 Get yourself a Traynor YBA-1 from the late 60’s or early 70’s. These Canadian aces are very similar circuits to a Tweed Bassman or Marshall JTM. there are mods to get them even closer. I’ve seen the heads go for less than $400. watch out for the Mark II-it is a different animal and pumps out 90 watts which might be more than you want. Gibson tweeds, surprisingly, don’t sound as good as Fender tweeds except for the wonderful GA-79 which is the ultimate ES-345 stereo amp. Feel free to send me your experiences with modern or boutique amps and I’ll pass them along-a kind of readers poll for modern amps. I hear wonderful things about a lot of the Marshall clones like Metropoulos. I had a (now defunct) Blockhead that I took in trade that was pretty cool but a very big amp to haul around for an 18 watter (2 -12″ Celestion Blues). very much like a lower powered version of my ’68 Marshall. As they say, tone is extremely subjective so, again as they say, your mileage may vary (YMMV, as they say). This leaves me with the burning question: Who are “they” and why do they have so much to say. Refret. Do You Care? Should You? Got Nibs? Then you probably got original frets, too. I know this isn't a Gibson-it looks like an Epiphone with those parallelogram inlays. After 50 or so years of use, you can bet the frets are going to start showing some wear. There has been a lot of discussion about whether a refret devalues a vintage guitar and I don’t want to spend much time on that aspect. 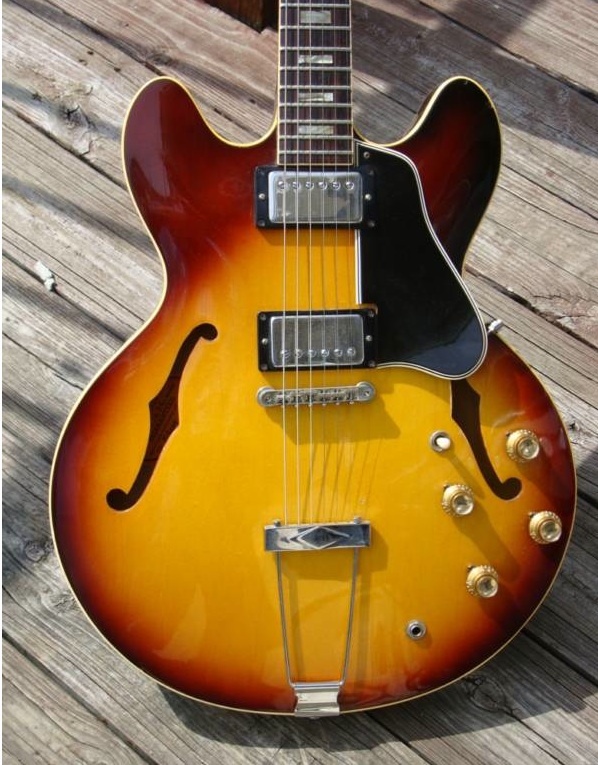 Suffice it to say that if you are spending top dollar for a mint, under the bed ES-335, ES-345 or ES-355, it probably should have its original frets. In all other situations, it doesn’t really matter that much. If you are buying the guitar as an investor, then original is probably a better bet but not a priority. If you’re buying to play, the get a guitar that has good frets-original or otherwise because A: a refret by a good luthier is expensive and B: Bad frets will make your guitar no fun to play. What I mean by bad frets is either they are so worn that the guitar won’t intonate properly or the guitar buzzes at certain frets or a refret is so poorly done that the frets are all different heights or loose or some other indicator of poor workmanship. So, how do you know? Well, the good news is that it isn’t that hard to see a refret on a guitar that has a fingerboard binding. When the guitar leaves the factory with its original frets, the binding has little “nibs” that run slightly up the end of the fret. When a 335 is refretted, nearly all luthiers don’t bother to replicate the nibs. It’s just too much work and no one seems to care that much about them. No nibs always means a refret. Another thing to look for is if the frets overhang the binding. In a factory fretted guitar, the frets stop at the binding with no overlap. Now if the frets don’t overlap, it doesn’t mean they are original but if they do, then they definitely are NOT original. I happen to think its a nice look for a refret to have the fret tops run over the binding but thats just me. It also gives you a little more fret for bends on the high E if you bend toward the edge of the board. The most important thing in a refretted guitar is that the frets are set evenly into their slots, are all the same height (check with a straight edge-it should touch every fret when laid on top of them) and are nicely crowned and polished. If the frets are very wide and flat, the guitar isn’t going to intonate well because the area of the fret in contact with the string is too wide. 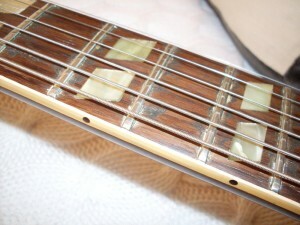 The string should only contact the fret at a single point-making contact with as little metal as possible. That means if it was refretted with those big jumbo frets that so many players like, they had better be crowned-that is rounded off so there is a clear “high” point on each fret. If you play very lightly, the problems associated with bad frets will be minimized but if you press down hard and play with a heavy hand like I do, tall frets will cause tuning problems because you’re pushing the string down behind the fret right to the surface of the fingerboard and your note will be sharp. So lighten up if you can. 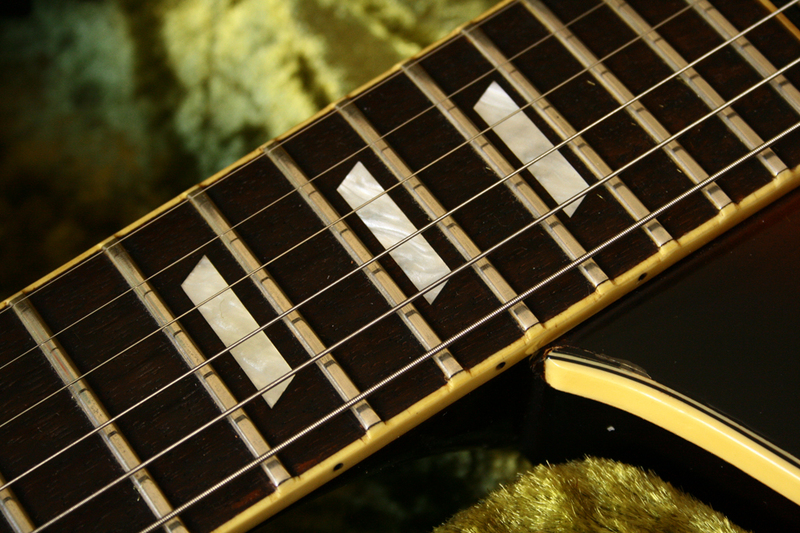 If you’re a big note bender, you’ll definitely want you frets to be in good shape. When you push the string across the fret, you want the height top be consistent so the note will continue to ring as you raise the pitch. 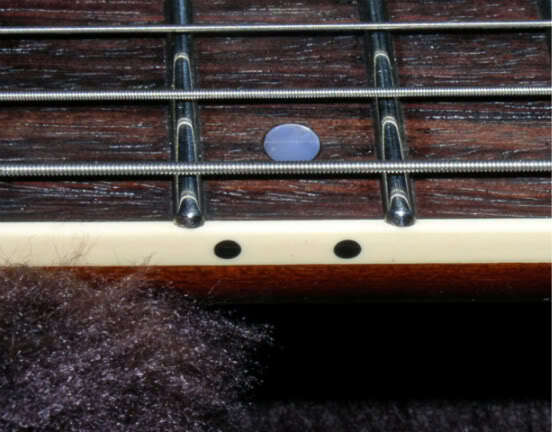 A fret with flat spots will “fret out” and dampen your tone and your bend. So, while we haven’t really done anything to solve the age old if it’s refretted, does it lower the value issue, I think it’s clear that a good fret job is superior to badly worn original frets. Remember a good fret job is going to cost you at least $400 so look at them before you buy that 335. If it’s beat to hell and the frets aren’t worn, that’s a refret. If it’s dead mint and the frets are worn down to the fingerboard, you might want to check to be sure it isn’t a refin. Here's a nicely executed fret job where the frets overhang the binding. No nibs here. You want Issues? This Great old 59 ES-345 Had 'em in Spades. 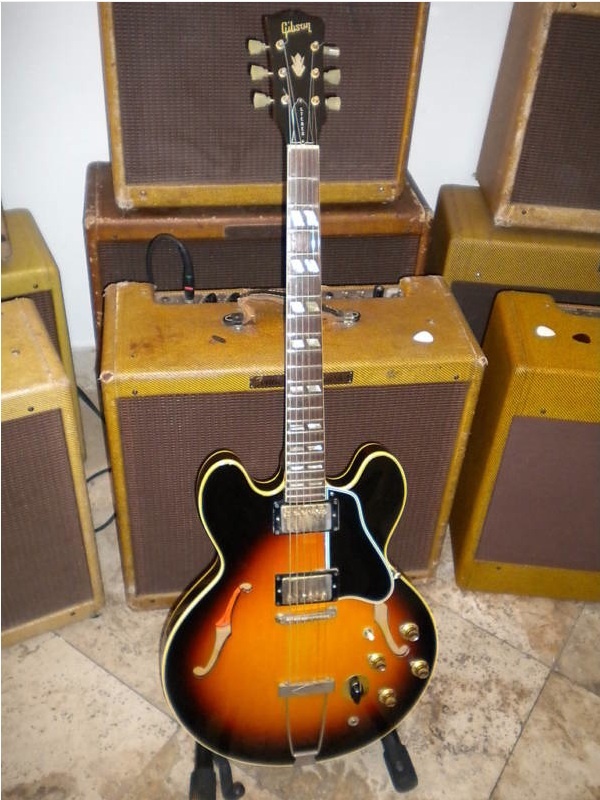 People buy vintage ES-335s and their brethren for one or both of two reasons. They are either collectors who want to own them and look at them and “have” them and maybe watch the value go up or they are players who want to play them and experience the tone of a true vintage instrument. Oh, and all combinations and permutations of the above. After 50 years or more of existence-and this goes for people as well as guitars-a certain amount of wear and tear is expected. And, mostly with guitars, a certain amount of modification occurs. Come to think of it, I know some people who have had some pretty serious modification as well. Hmm. When you’re in the market for a 335/345/355, how much modification and/or wear should you expect? What about repairs? Changed parts? This could be a very long post but we’ll start with some basics and see how long it goes. As a collector, it is pretty well universally agreed that the better the condition nand the more original a guitar is, the more it’s worth and the better the investment True, mostly. How about when you are looking at, say a dead mint ’69 for $5000 or an original but worn 66 for the same price? In my opinion, dead mint is dead mint and can’t really be played because it won’t be dead mint for long but dead mint commands a premium no matter what the year. So, I would have to say that a dead mint 69 is a better investment than a nice old 66. If you plan on playing however, the opposite is probably true in this case. The 69 will probably have a 3 piece neck and a short tenon and T-top pickups while the 66 will have a one piece neck, long tenon and pre T-top patent number pickups. Which would you rather play? Again, no brainer. It won’t always be that easy because dead mint doesn’t come along very often and so we have to deal with shades of gray rather than black and white. How about a 59 dot neck with a replaced neck for $10,000 or an all original 64 with some extra tuner holes and a removed Bigsby for the same price? Well, the 64 is probably the better investment since neither tuner holes or removed Bigsbys are dealbreakers (to me). Neither is a changed neck as long as everything else is straight and the work was done by Gibson. After all, the 59 will have PAFs and the 64 won’t. However, for a collector, the 59 isn’t going to ever appreciate in value very much because, fundamentally, it is no longer a 1959 guitar. Even with its extra holes, the 64 is still intact and original and that means the world to the collector. What about neck repairs? I bought a 64 335 for $2200 with both a reneck and a neck repair. The price was right for its deficiencies and these things were, as a result, not dealbreakers because the price reflected the deficiencies. It turned out to be a great player and I sold it to a dealer for a decent profit. Changed pickups? They can always be changed back if the price is right. Repairs and extra holes are there forever, so consider such guitars very carefully. If you’re a collector, any repair is going to be a dealbreaker. If you’re a player, a well repaired break can last forever and be an excellent deal. Refinishes? I’ve covered that in an older post but again, for a collector? Dealbreaker. For a player? Not a dealbreaker if the price is right and the price should be around 50% of an original finished one. What about extra holes? Well, it kind of depends where they are. I generally avoid guitars with holes in the top but extra tuner holes don’t bother me much. Even little holes in the top-like from removed Bigsbys or Vibrolas don’t really bother me as long as the price reflects it. Big holes from removed coil splitter switches that are in odd places? Dealbreaker (usually) even if repaired. 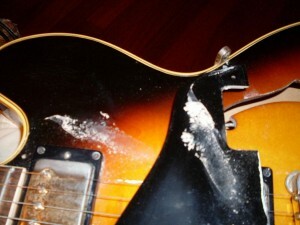 Here’s the usually part…I had a 59 ES 345 that had 4 separate repairs in the top but was otherwise a great guitar. The finish was stripped from the top as well but it had 2 of the sweetest sounding double white PAFs I’ve ever heard. I paid a little under $10,000 for it at the very top of the market. I don’t think I’d pay that today, but it was a pretty good deal at the time. Again, the price made sense for the wear and tear. The pickups alone were probably worth $8000 at the time. So, look carefully at what’s available and understand that a player can tolerate a lot more crap than a collector and if you don’t care if you make a dime when you sell it, an “impacted” guitar can be a great deal and an even better player. There are plenty of other issues to look at specifically and we”ll eventually look at them all. And remember, friends don’t let friends buy 70’s ES 335s without playing them first.